A unique and beautiful Blowable "Pocket Windmill" app released. Welcome to "Pocket Windmill" Experience. 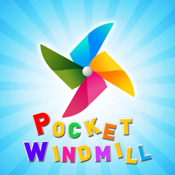 The "Pocket Windmill" app will give you a never seen fun and user experience. Just blow it to rotate windmill and swipe left/right to change background and windmills!! It gives you a fun experience for you!! - Various Windmills and Backgrounds. - Stop the windmill using stop button. - Rotate the windmill by blowing the mic or swipe up/down the screen. - Blowing the mic or just speaking to the windmill to rotate the windmill. - Close the Scene to touch "X" Icon at the top right. -To save current situation as a picture, simply do a screen capture by holding down the Home and Power buttons simultaneously. 입으로 불면 돌아가는 "호주머니속 바람개비"가 아이폰 앱으로 나왔습니다. 아름다운 바람개비는 여러분이 직접 바꿀 수 있으며 배경화면 역시 변경가능합니다. 마이크를 불어서 돌아가는 신기한 바람개비를 함께 즐겨보시기 바랍니다.